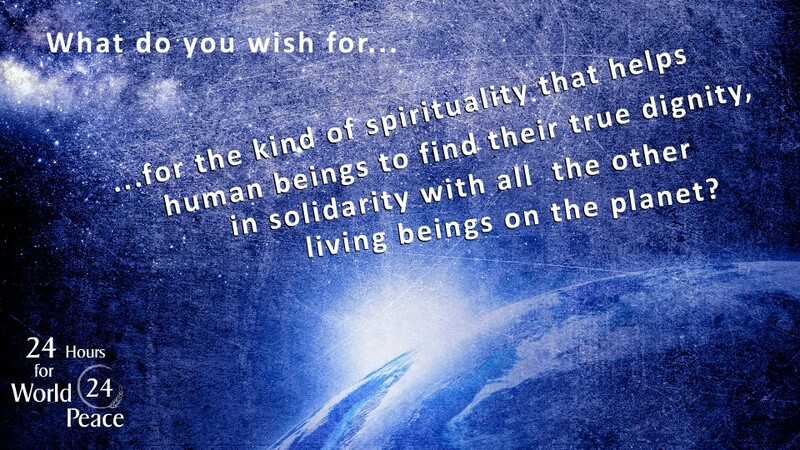 What are your wishes for the kind of spirituality that helps human beings to find their true dignity, in solidarity with all the other living beings on the planet? “Peace is that precious chain that connects the World with the beads of Love, Hope, Faith, Selflessness and Happiness. The desire for a Peaceful World is achievable when every human being practices peace in thoughts, actions and deeds. ← What are your wishes for the future of information-sharing? We support the holiness ad his principles towards achieving a better and peaceful world. Its possible to achieve peace if we also practice his principles. I would extend my heartiest Congratulations to His Holiness, what a remarkable victory! “Peace” as His Holiness mentioned is possible only when each one of us practice the same. We wonder what role we have to play in all the crisis and blood shed happening around the World? We sit in our little homes watching the News channel and know about the conflicts and violence committed every minute of the day. Our role doesn’t end in just knowing the facts around us and just be informed. Each one of us have the responsibility to spread the word of Peace around us no matter in the most smallest way possible. Even just sharing a Peace message on this website or just discussing on Violent issues in your locality or just supporting for a peace cause or just telling your children the importance of living in peace or just signing for a peace campaign or promoting a Peace Mission or attending a Peace workshop or sharing your views and thoughts on Peace on Facebook, twitter or through other channels …As we all know we can list 100 of ways of how each one of us can contribute to Peace so As His Holiness have said Peace is a Chain that connects all of us and we are beads of this chain and we all have to work for peace to keep that chain secured and tightened so Lets joins hands in this New Year 2015 to stand for Peace, Work for Peace and live for Peace in our every little possible way and never ignore or stay still doing nothing. Hats off to the Commendable work of the Public Peace Prize Team in setting these great connections across the World and introducing the Gems of Peace to the World. (12 Finalists). My Peace Greetings to One and all. All of us at West Suburban Faith-Based Peace Coalition are filled with joy that His Holiness has been declared the winner of the 2015 Public Peace Prize. Everyone on the planet should share His dream that all children in all schools and in all grades are taught the basics of peace: the rejection of violence and the respect and compassion for all. We anxiously await His visit in 2016. That we will see the Creator in ourselves and every human being, blessed with basic human dignity and work steadfastly with love, reconciliation and justice to dismantle institutional racism. Guru Ji, firstly our respects for this bestow ent of public peace prize award. You compliment all the above and it would be great to share this to entire human race. I wish all the time we should be able to have faith on God and choose the right path of nonviolence to make the peace in the world. A very hearty congratulations to His Holiness for his remarkable victory !!! I congratulate His Holiness Dr. Vasanth Vijayji Maharaj for winning the most deserving Peace Prize Award 2015. I pray to the Almighty for the completion of Gurudev’s World Peace Mission successfully. it was not a surprise but definitely a faith getting proved.With my entire family,I would like to congratulate you on this unseen, unheard and fabulous achivement.I live in USA and feeling proud to belong to India..It is an indeed proud moment for all of us. I read with great delight your name published on this website. You have won the Public Peace Award 2015, one of the most coveted prizes for Peace internationally. Your dedicated perseverance and devotion and immense efforts to international peace have won this honour. My sincerest wishes are with you. I join with your followers and admirers in offering you my heartiest congratulations. May your unremitting endeavour in International peace go on with undiminished vigour! The Perfect person for the perfect award. Dr.Vasanth Vijayji Maharaj is quiet humble and has a great responsibility on his shoulders to make this world a place of peace to live a prospours life . Long live Dr. VASANTH VIJAYJI………. Its a great opportunity to congratulate Dr. Vasanth Vijayji Maharaj on this achievement and my best wishes are always with Guruji. I like to congratulate His Holiness Dr. Vasanth Vijayji Maharaj for winning the most deserving Peace Prize Award 2015. I pray to the Almighty God that he gives him loads of strength to completion of Gurudev’s World Peace Mission successfully. JAI PARSHWANATH. Our heartiest congratulations to his Holiness Shri Dr Vasanth Vijayji Maharaj, for winning the coveted peace prize. He has untiring dedication to bring peace to mankind. His selfless efforts has made a huge difference to many lives. His thoughts and actions are a huge inspiration to millions of people. Congratulations to His Holiness! Indeed a Proud Moment for All Peace Lovers. His Holiness have won this Award in the honor of those millions of Peace Workers out there who dream and live for Peace. This Award is for those countless people who pray for Peace in their homeland and around the World. This Peace Prize is symbolic of the happiness and bliss that prevail when peace is achieved . In fact, the World Peace Leaders like His Holiness keep the spirit alive and constantly remind us of our responsibility in this. I hope and pray that let peace be the order of the day forever with no violence anywhere and that will definitely be accomplished one day. My deepest prayer with folded hand at His Holiness Lotus Feet. It’s great pleasure to hear that H.H award as INTERNATIONALLY-REPUTED PEACEMAKER 2015. Once in while in Galaxy certain things take place like that this award also got awarded it self. As there is no measurement or award that can certified H.H Mission & Vision for peace. yet for sake of materialistic world this award. Once again My Prayer at H.H Lotus Feet. HEART NEED SPACE MAKER FOR LIVING , WORLD NEED PEACE MAKER FOR KEEPING LIVING CREATURE LIVE. My sincere warm regards to Public Peace Prize for organizing such programs and awards. we million of follower of Dr. Vasanth Vijajji Maharaj feel that we have been honored. Gurudev My veneration for award. On behalf of all peacemakers in the West Suburban Faith-Based Peace Coalition I extend hearty congratulations to His Holiness for winning the 2015 Public Peace Prize. We are so happy that this Saint is recognized the world over for His messages of peace and His mission to see that children learn the path of peace and nonviolence at every educational level. Only with such a comprehensive commitment to peace by every nation will the dream of world peace become a reality. We anxiously await your visit to Chicago next year. I congratulate his Holiness on his success and wish him much more success for the coming future and that his efforts carry on changing people’s lives. I am really really happy that the well deserving Vasanth Vijayji Maharaj has won this award!!! Many congratulations. I bow down to his feet and seek the guidance to walk on the path of peace and spirituality. I have learnt from him that Spirituality is about an individual being able to obtain liberation and experience eternal bliss by transforming themselves into an image of god (the original state of man). His Holiness is a great seer that is walking the path of spirituality and peace, and also taking his millions of devotees with him. Best wishes! My heartfelt congratulations and best wishes to Gurudev. Hoping his world peace efforts gain more success in the future. A great soul! His body is a temple and God resides in it. Thanks to Public Peace Prize Org for giving the award to the most deserving individual. 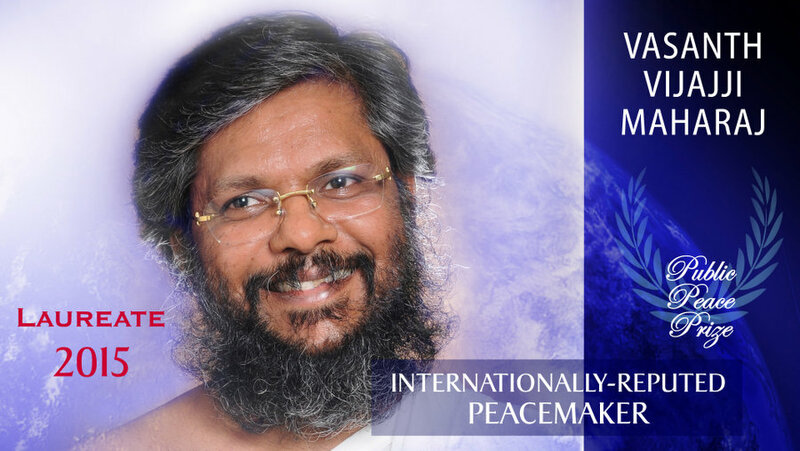 Congratulations to Vasanth Vijayji Maharaj for winning the Public Peace Prize award! An amazing result and by far an outstanding victory! My best wishes go out to him for his mission for world peace. He is always in my prayers! Spirituality to me is every soul living peacefully, in harmony like a global family, and helping each other grow as a spirit towards god. I congratulate His Holiness!!! Happy to know that he won the Award! Hoping his peace work extends further in the future. We all need to work together for peace and we all need to take personal responsibility to make it happen. One man cannot do it alone! We all need to join hands. I congratulate his Holiness on his success and wish him much more success for the coming future. His Holiness WON!!!! 86% of support for him! That’s brilliant! But it makes sense though, because he is extremely influential and i am not surprised that so many people follow him and support him. I have been a follower of Gurudev for many years. His blessings have always been on me and my family. I have attended plenty of peace events arranged by him and have learnt a lot from him as well. He is a preacher, a teacher, a leader, a master, a missionary and a spiritual inspire. Congratulations Gurudev! Vandan from all devotees of UK! Congratulations to Vasanth Vijayji Maharaj. A well deserved win! I sincerely agree with his views on peace. The main thing is that we don’t just talk about peace and spirituality, we should live it. Experience it ourselves and spread it amongst the people around us. Hats off to the hard work of PPP Org for promoting the people that truly work hard for world peace. Congratulations Gurudev! I am pleased to know he won! a huge win for him! My lesson learnt from His holiness is that we are not human beings having a spiritual experience, we are spiritual beings having a human experience. Spiritual practice is the art of shifting perspectives!!! We desperately need to shift the perspectives of people around the globe that are becoming more and more violent. I appraise what his holiness does selflessly and support his hard work for peace. I also respect PPP organisation for recognising his efforts. Congratulations to Vasanth Gurudevji! My salutations to his hard work and and kind wishes for the future. there is a desperate need for people like Vasanth Vijayji Maharaj, who can lead the masses towards peace. A lot of people in today’s society believe in taking an eye for an eye, they don’t realize that all this is going to end up doing is making everyone blind. We need to end the hatred and walk in the path of spirituality to bring happiness to our body, mind and spirit. Firstly I would like to congratulate His Holiness Vasanth Vijayji Maharaj for the well deserved win, being pronounced the world peace maker and awarded for his actions likewise. To me Spirituality is more personal, I feel we get in touch with our spiritual side through different means such as prayer, yoga, meditation, quiet reflection and many other activities. His holine has guided me so I could understand this. This topic was not of interest to me before I got to know his holiness, but now I look forward to discuss such topics to get into further depth. Practice of spiritual means have allowed to me attain peace at distress times. I solely give credits to his holiness for such guidance which has allowed me to establish the parameters. For some people spirituality might mean about participating in organized religion: going to church, synagogue, a mosque, etc. Different people take different approaches to spirituality and every way is right. There is no wrong. His holiness is a true peacemaker, he has preached peace all over and thousand have witnessed his achievements in realtion to peace events. His holiness has no selfish reasoning for himself but wills for the best of others and everyone. I wish him all the best for the future and the present time and accordingly hope he succeeds in his path towards world peace. Congratulations to His Holiness for this well deserved award. May we all work with him to bring peace to our world. Congratulations to Guruji for his win which he deserved. In the world of hatred , violence and anger such leaders are needed to be established well as they are set examples that can guide individuals on to the right path. Following his guidance can allow individuals to attain peace. Congrats to Gurudev. He is truly inspiring and has taught many things. I wish him all the best for the future. Congratulations to Vasanth vijayji maharaj. My meeting with him has been brief but I am highly influenced by his work. I believe that a spiritual individual is peaceful and likewise a peaceful person is spiritual. My most heartful congrats to Gurudev! He has taught many that the path to salvation begins in oneself. My best wishes for his promising future. My heartiest congrtas to the Gurudev! He is an icon of calm in a world full of chaos. My best wishes are with him for the future. My heartiest wishes for Gurudev. He has taught many that the path of salvation starts from within. He has guided many in the right direction and stands as a ray of hope to the helpless. Best wishes for his ever bright future. I would like to congratulate Gurudev for being awarded the public peace prize and for his success on the world peace mission. I feel very lucky to be born in an era when such powerful spiritual individuals like Vasanth Vijayji Maharaja roam this world. I am truly blessed to be alive at such a time. I congratulate Sri Vijayji Maharaj from my heart for being able to impress, inspire, and organize such a large number of people to work for making and sharing peace with all who come across him/her. Further I deeply and strongly desire to work for making this world worthy of God. A heavenly place to live and let others live. I,, therefore, wish to know about the Action Group that works under and with Vijayji Maharaj. About the people who are actively involved in making peace for the world. How they function as a Body? What are the guidelines they follow? What are the basic and common elements that the Action Group follows. What are the interreligious realities the Group reflects upon shares and spreads among the people to create a moral, humanitarian, and spiritual force that could be the at the foundation of the spiritual movement that emerges from the collective efforts of the truth-seeking members of the Public Peace Prize (PPP) international family. I wish and pray that the PPP family be blessed with divine inspiration and celestial activation to become an agent of Love, Peace, and Joy of God on this violence-torn earthly world.